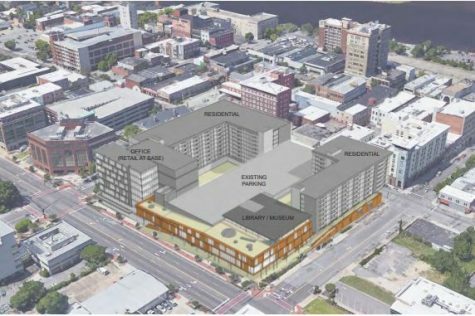 WILMINGTON — Preliminary designs for New Hanover County’s redevelopment project of an entire downtown Wilmington block, better known as Project Grace, have been submitted and now, the developer is seeking public input from county residents. Project Grace is appropriately located on Grace and 3rd Street where the current New Hanover County Library and parking garage are. The new project will completely redesign the library as well as relocate the Cape Fear Museum to the downtown location. The project was first announced in 2017 and several different companies submitted initial plans for the project, but in December of 2018, Zimmer Development Company was the sole company to submit a full proposal. Project Grace will take up the entire Grace Street Block but will leave the existing parking garage in place. According to the design presentations, it will also include two large multi-story residential buildings as well as office space with retail at the base. According to preliminary plans, the development will begin with the library and museum combination — the current library will continue to operate until the new one is ready to open. In addition, the first 125 residential units will be constructed in conjunction with the library and museum. Once demolition of an existing facility is complete the construction of the second tower of residential units will begin. The third phase will see the construction of office space — or possibly a boutique hotel. “The existing ‘Story Park’ will remain open and in use until a third, future phase of office tower or boutique hotel. This future phase is strictly market driven. The arrangement of program creates a simple zoning of the block into a residential zone that is West-facing towards the waterfront, retail and public activity along both Chestnut and Grace Streets, and a commercial/cultural zone that faces 3rd Street,” according to Zimmer. The full design plans can be found online for those interested.